Camerawork Gallery is the nation's oldest continuously operating fine art photography gallery, founded in 1970 through the encouragement of Minor White. Showing at Camerawork felt like a history lesson, and an honor to be a part of. Below these photos, you'll find an artist statement that will tell you what I was thinking about in 2014 when I started making these black and white images. The show at Camerawork Gallery in 2015 was my first solo photography exhibit, comprised of twenty-five images, each in an edition of 20 at 11"x14", printed on fine art matte papers. It was in printing this work, in the practice of making the prints, that I felt that I got a handle on digital art making. Here's the artist statement that went along with this show. 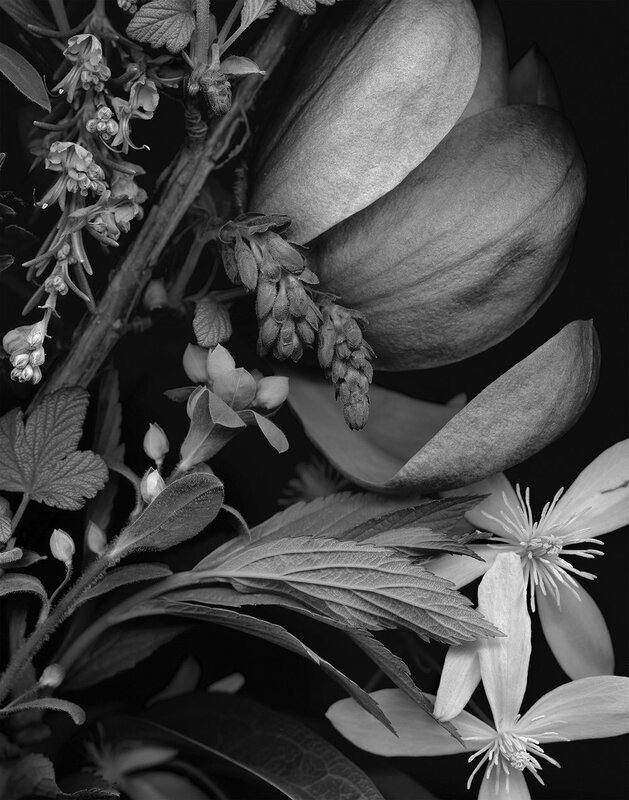 In about 2012, taking classes at the Oregon College of Art and Craft’s Studio School, I began experimenting with using OCAC’s Digital Lab’s scanner as if it were a high resolution camera. 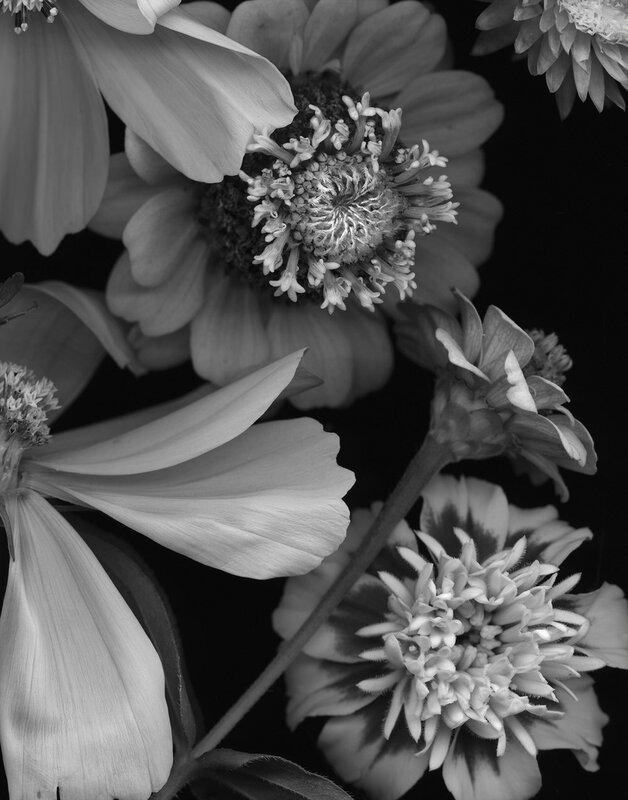 At first my experiments were simple, laying flowers picked from my garden on the scanner glass, then learning how to use Photoshop to effectively clean up the scans and print the photos. I’ll never forget the jaw dropping sensation of seeing my first 34”x 48” print emerging from the printer, a magnification of 16x. After I had made a few images that were really exciting, I slowed way down to figure out what the excitement was about. 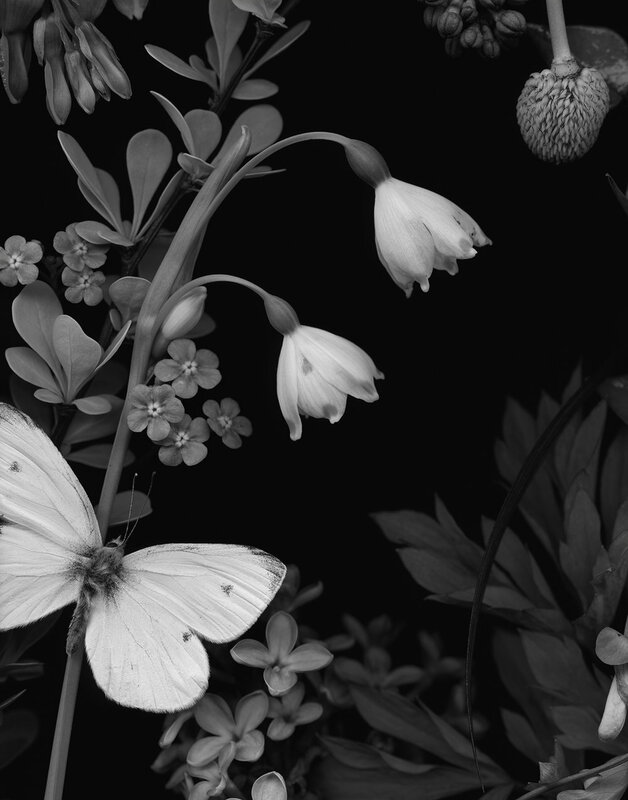 I bought a scanner so I could cut delicate flowers and scan them immediately before they wilted. I bought a computer with a lot of memory and a massive hard drive. 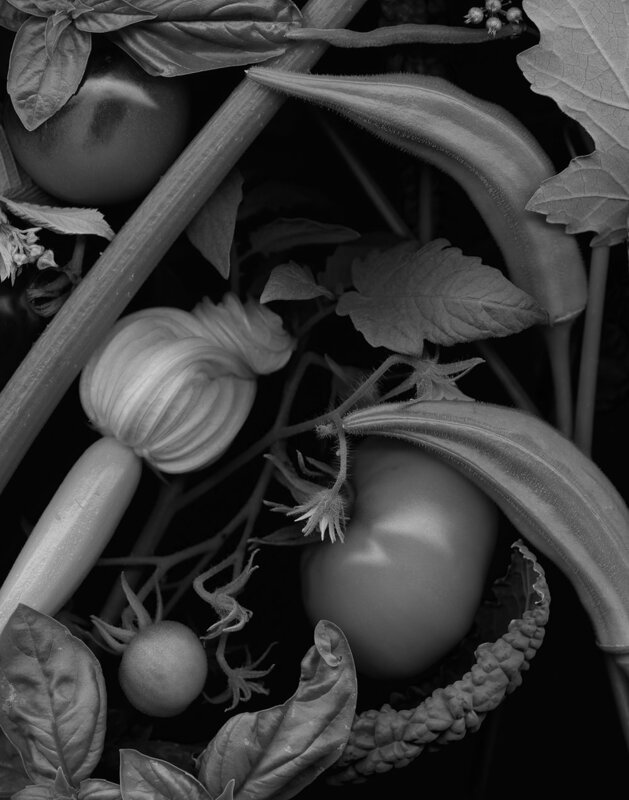 My husband and I planted our garden, and as it grew, I picked and scanned our harvest. When I first studied photography in a serious way, it was in graduate school in the late 1980’s, and my teacher, Walt Cotten, was a full-frame fanatic. Composing one’s work in camera was the only way acceptable, proven by the black line created by one’s negative holder when printing. Cropping was taboo. And so, for the past three decades, that’s just how I think about composition. Get it right, the art happens in the camera, at the “decisive moment”, all that. Even using digital cameras for a decade now, I still frame the whole subject and am prone to rejecting an image that might be improved with just a wee bit of cropping. A side effect of working in solitude is a single minded focus that can lead to believing that one’s work has to be a certain way—a way that I myself have directed, but if there are no witnesses to say “what if?...”, it is too easy to believe in one’s own rules. 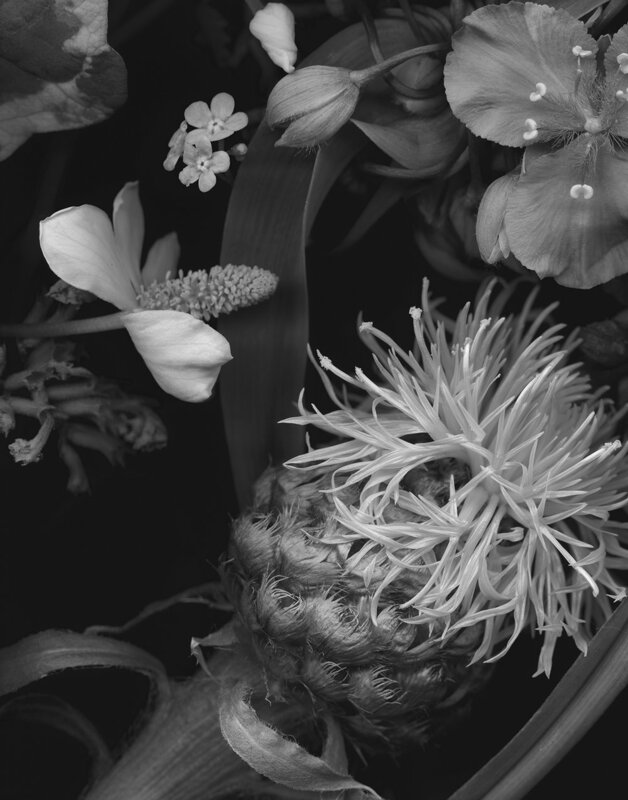 A recent re-reading of a book of collage pieces by the artist Karl Blossfeldt has pushed me into thinking that I need to break some of my rules, which resulted in this body of work. 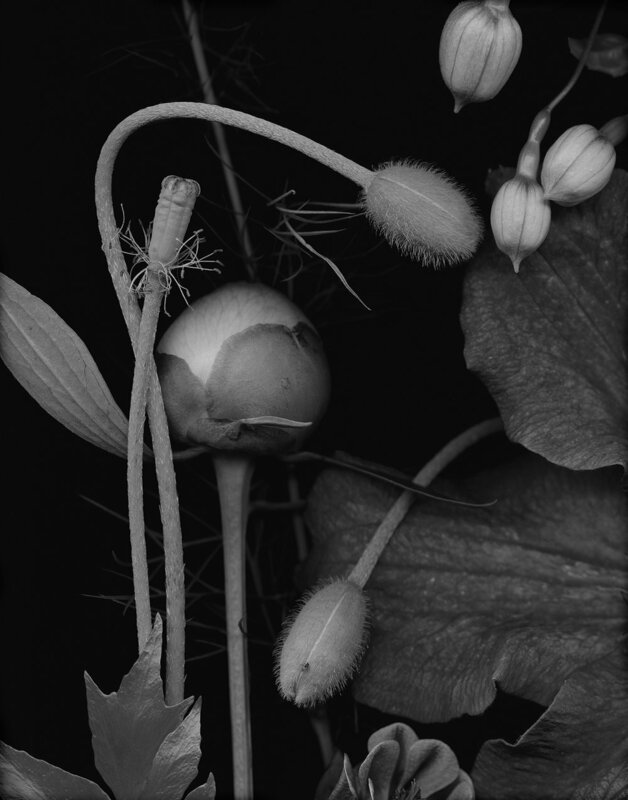 Around 1994, I was given a book of photographs by Blossfeldt, with whom I felt an immediate kinship. From the late nineteenth century till his death in 1932, Karl Blossfeldt was an artist, a teacher, a photographer, and for a short time, a metal worker. 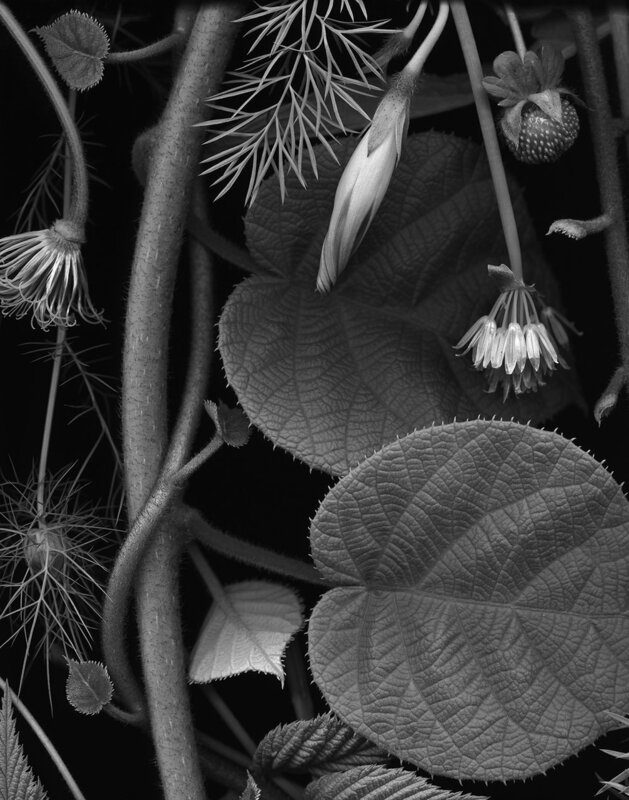 He was interested in observing and recording nature through photographing plant forms. 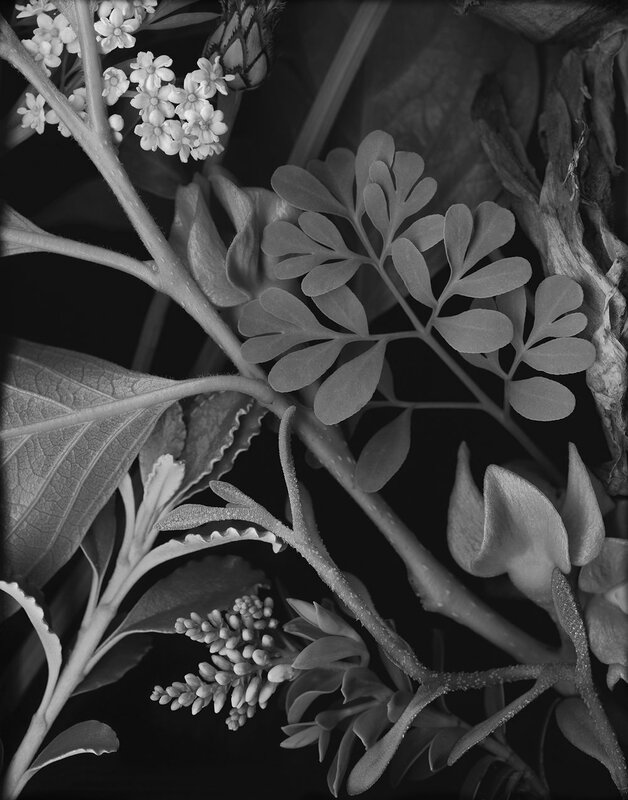 Blossfeldt used a camera with special lenses that could magnify objects, and created botanical photographs intended as study guides for his students, architects, and industrial designers. Blossfeldt’s compilation, “Urformen der Kunst” (“Forms of Nature”), printed in 1928-29 in photogravure, continues to inform artists and designers. His straightforward, rigorous compositions were always assumed to have been composed in camera, but in 1977, a stack of his collaged works were found. They were made of cut-up contact prints that indicated that his original compositions were merely recordings done in the most economical way that the early twentieth century had to offer. 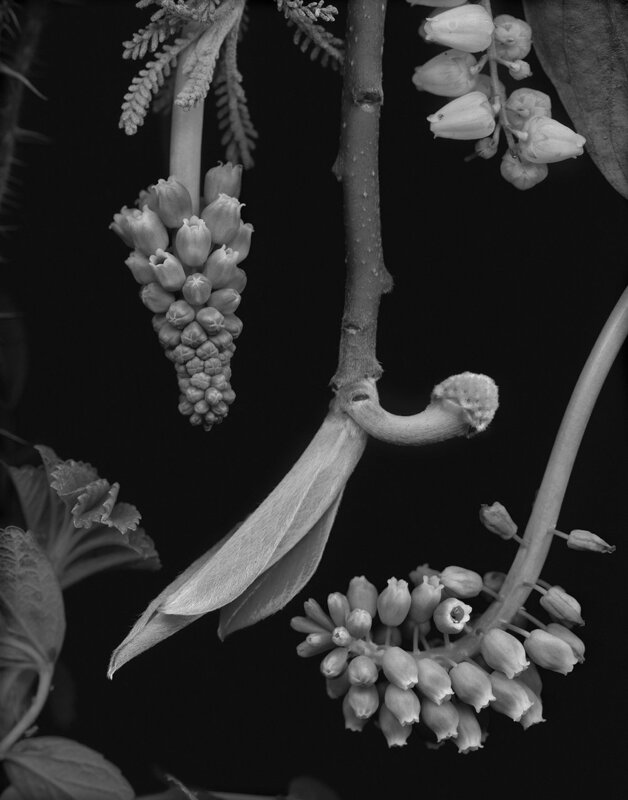 Blossfeldt lined up a few plant forms together, sometimes dissecting plants to get them to look the way he wanted, gluing some parts together, then photographing them in natural light with exposures of 8-12 minutes. Only during the enlarging and printing processes did the actual composing of his work occur. Upon learning this, it occurred to me that I might be able to pursue my own work in a similar fashion, one where the end result might not have to rely on the perfect composition at the moment of making the image, or that a portion of an original image might offer a more interesting composition. This might sound like a small revelation, but these small things lead to bigger ones. I had been so dazzled by the colors of the subject matter that I work with, that it had only fleetingly occurred to me to drop out the color and see what my work looks like in black and white. Looking at Blossfeldt’s original contact prints, and comparing them with his better known photogravure works, I wondered what my work might look like if I learned a workflow in Photoshop for printing in black and white, and printed on beautiful modern papers that offer a resemblance of old printing processes. If you want to own one of these, please contact me. The prints are sold as pieces in a limited edition of 20 only. They are printed on archival fine art papers with pigment inks. Each is $300, matted to fit a 16”x20” frame.